The period between 1917 and 1957, starting with the birth of the USSR and the American intervention in the First World War and ending with the Treaty of Rome, is of the utmost importance for contextualizing and understanding the intellectual origins of the European Community. During this time of 'crisis,' many contemporaries, especially intellectuals, felt they faced a momentous decision which could bring about a radically different future. The understanding of what Europe was and what it should be was questioned in a profound way, forcing Europeans to react. The idea of a specifically European unity finally became, at least for some, a feasible project, not only to avoid another war but to avoid the destruction of the idea of European unity. 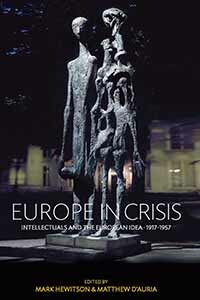 This volume reassesses the relationship between ideas of Europe and the European project and reconsiders the impact of long and short-term political transformations on assumptions about the continent’s scope, nature, role and significance. Mark Hewitson is Professor of German History and Politics and Director of European Social and Political Studies at University College London. Matthew D’Auria is Lecturer of Modern European History at the University of East Anglia.